We are delighted to introduce you to Luigi Braces, an adorable 3 1/2" Braces Boy. 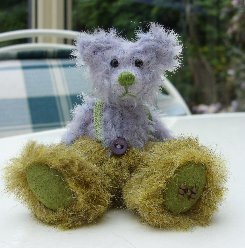 He is made of gorgeous lilac South African mohair, straight and fairly sparse whilst his trousers are made of really dense, sage green alpaca, soft and lovely. The contrast in colour and texture works really well. Luigi Braces has a green stitched nose, sage green ultrasuede pads and pale grey ultrasuede paws. He also has green ribbon braces, a lilac belly button and is steel shot filled to give him a nice weight. I really like this little bear, I think his colours work well together and he has a very sweet face. I hope you like him too, he costs £39 plus postage. Please note that as with all our bears, Luigi Braces is not a toy and is not suitable for children. Sorry - Luigi Braces has been adopted.